Andree Lau The Huffington Post B.C. Someone cut off several teeth from an endangered orca as she lay dead on a Vancouver Island beach, awaiting a necropsy by scientists. 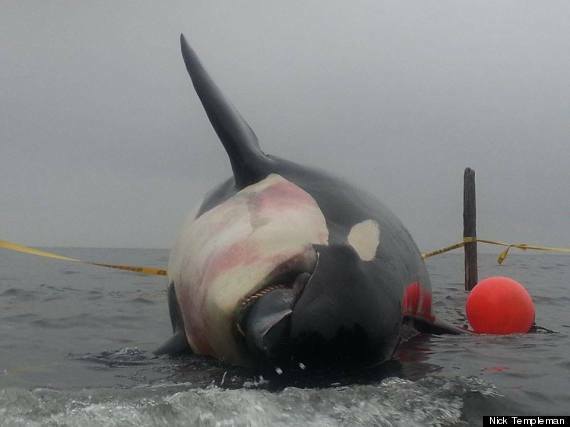 The deceased killer whale, identified as J32, was found floating near Courtenay, B.C. earlier this week. Residents and animal advocates discovered that the mammal's body was defiled overnight. A necropsy on Saturday revealed J32, nicknamed Rhapsody, was pregnant with a full-term fetus. 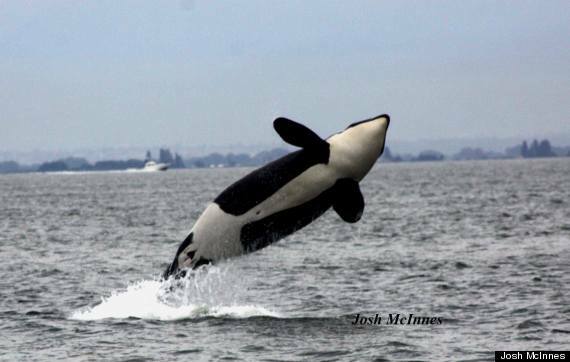 Her death means there are now only 77 members of the Southern Resident Killer Whales who live in the waters off B.C. and Washington state. The loss of J32 is also considered a blow to recovery efforts because there are so few breeding females. “It’s always a concern to lose an individual from a very small population of endangered animals," said Lance Barrett-Lennard, Vancouver Aquarium senior marine mammal scientist, in a statement. J32, nicknamed Rhapsody, was photographed in June. UPDATE - Dec. 7, 2014: The Department of Fisheries and Oceans is investigating the theft of the teeth, but Paul Cottrell, the Pacific marine mammals co-ordinator, said officials don't know what motivated it, such as whether it might be linked to the sale or trade of endangered species. The federal Species At Risk act makes it illegal to possess part of an endangered or threatened animal. 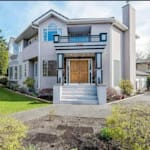 The law carries a range of sentences depending on whether the perpetrator is a corporation, non-profit group or a private citizen. For individuals, the maximum penalty is a fine of $250,000, up to five years in prison or both, though maximum sentences are rarely imposed. "It's just a senseless, illegal act," said Cottrell. "We take this kind of thing seriously. We don't want endangered species parts being traded or sold." Biologists who have been examining the whale have yet to determine a cause of death. Tissue samples from the orca and the fetus will be examined at a number of labs across North America, said Cottrell. Results are expected in four to six weeks. The skeletons will be donated to the Royal B.C. Museum.